South Pole TM aims to help individuals and businesses to reach sustainability commitments and goals by accelerating the transition of carbon emissions to a low-carbon and climate-resilient economy, whilst at the same time, contributing towards the growth of the renewable energy industry in hopes for a future of 100% renewable global energy. 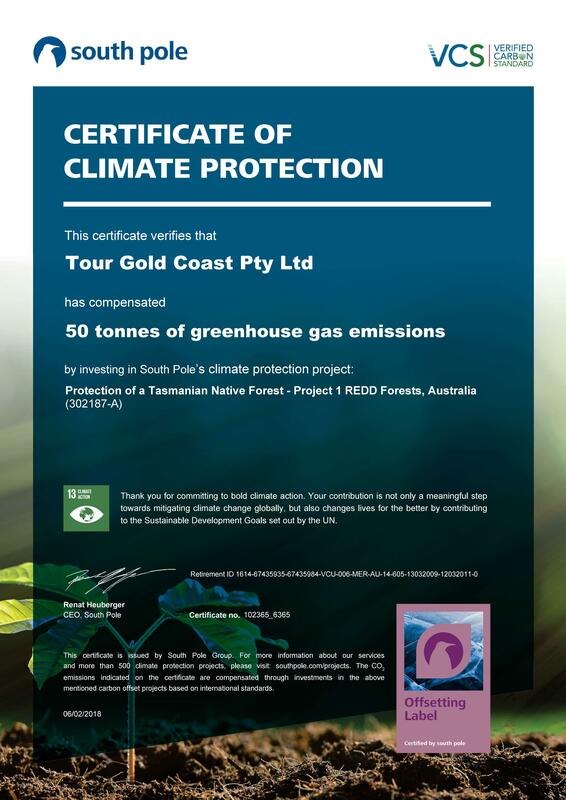 Tour Gold Coast have so far compensated 50 tonnes of Greenhouse Gas Emissions by investing into South Pole’s climate protection project. The carbon credits that South Pole source are from accredited and new renewable energy projects whilst supporting the UN Sustainable Development Goals.